This 'One of a Kind' cabin that we call 'Great Sky' was created and built by a local rustic furniture craftsman and is a showcase of his talents in his design and abilities. He not only built the cabin but added his personal touch in creating custom cabinets in the kitchen, a wonderful staircase to the master bedroom and custom 'one of a kind' furniture throughout the cabin including chairs, beds, dining tables, rockers, etc. You must see to appreciate his talents. 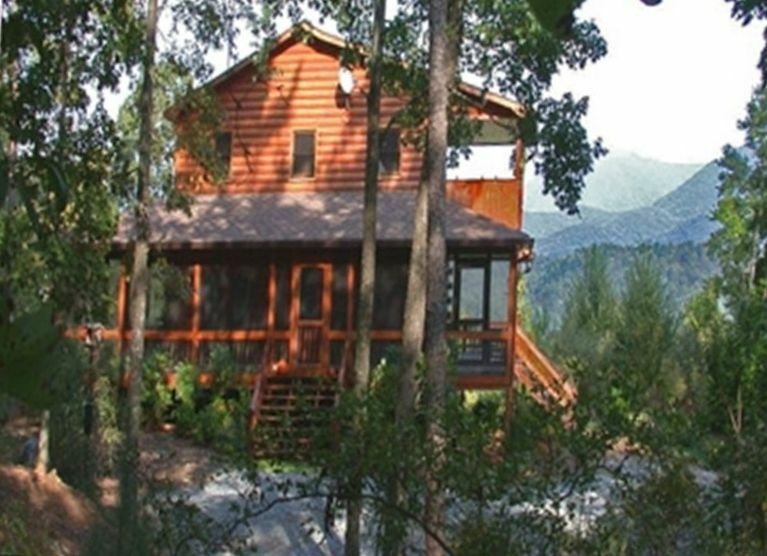 Additionally, this cabin shows some of the best possible views in Ellijay looking out over the mountains and the surrounding national forests. From the master bedroom, or the private deck off the master bedroom, or the living area, or the back deck, you can see breathtaking, million-dollar views year round! The cabin is also located in an area with paved roads and easy accessibility to the cabin year round. Golf courses are located near by. Additionally, visit the City of Ellijay, 'The Apple Capital of the South' or Blue Ridge (ride the train) within minutes from the cabin. There is plenty to do and plenty of great restaurants to try. You can go horseback riding, rafting, or pick apples in the fall. Or you could just relax on the hammock, read a book, or fall asleep! We enjoyed our two week stay while in between a house sale and a house purchase. Nice views of the mountains and the roaming deer. Our dog loved walking the area. The quiet area suited us well. We had a wonderful weekend at the cabin. It was very private and cozy. Definitely will be back for a longer visit! The beauty is in the DETAILS!!! I give this cabin the highest rating possible!! I have stayed in quite a few cabins over the last few years and this cabin is by far my favorite!!!!!! Not only is the view amazing, but there is nothing you will need that you will not find at this cabin! You enter to soft instrumental music, a breath taking view and it always smells so good!! Fresh linens, luxury bedding, every dish, pot and pan imaginable that you would need. The fireplace Is amazing! The hot tub is amazing! The details in the decor and the furniture is amazing! The lovely porch wrapped around the house is amazing! Screened in and out... with ping pong! Wow! And don’t even get me started on a beautiful loft upstairs....with a porch! Soak in the garden jetted tub with candles surrounding you and just slip away. If you can drag yourself from the cabin be sure to check out Mercier Orchards and do not dare leave without a peach pie!! We have stayed at this cabin a couple times and when ever We get a chance.... we will be back again!! Loved how cozy this cabin was. Felt very private and the outdoor space was great. The beds were also very comfortable. It also was very close to stores and downtown Elijah. I stayed here with my family of four over Thanksgiving. Overall, a good experience and the cabin is great. Below is the pro and con list. A few upgrade/refreshes and this would be perfect. 1. The Kitchen was fully stocked and modern. 2. Nice Ping Pong and Foosball table. 3. Wood supplied for the fireplace. 5. Seating for 6 for meals. 6. Wi-fi stayed around 2MBPS just good enough for the kids to stream. 7. Flat screen Modern TVs in both bedrooms. 8. Very Comfortable Bed in Master Bedroom. 9. Nice View!! Trees could be trimmed a little to make it amazing!!! 10. Hot tub is in good working order. 11. Games/cards and puzzles in the closet for use. be a big deal if it is just one couple going. 3. Hot tub cover is breaking and very hard to manage. sharp so you have to be careful. 5. The large TV in the Living room is a very old SD projection model. waiting at the door at 10:45 for us to leave. 7. Water heater is not big enough to fill up the large tub in the master bedroom. Incredibly nice and cozy weekend! The property was impeccably clean, everything was as it said and more. We were delighted with our stay and are already talking about the next time we can get away and stay here again. Rates are subject to change based on availability, seasonal or prime time events Stay minimum of one week/ get one day free of charge!